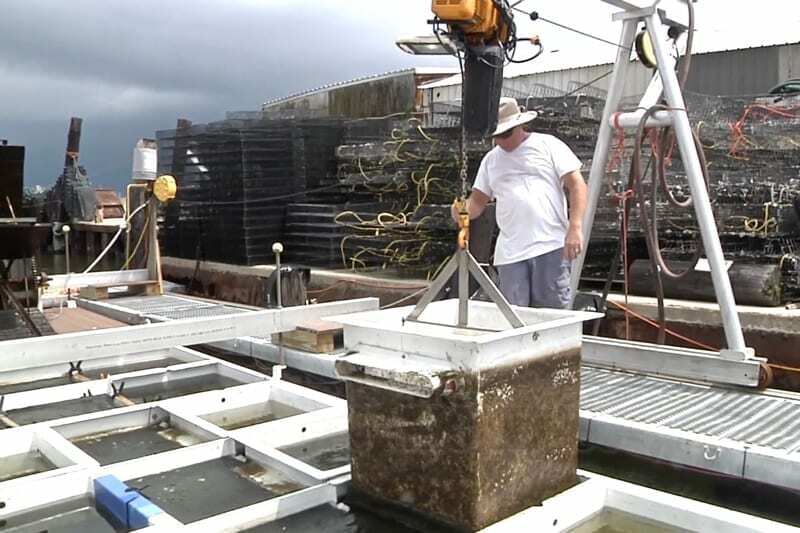 Joey Daniels runs an oyster farm out of Wanchese. Should oyster farming in North Carolina be a cottage industry or marine industrial operations owned by nonresident corporations? That is the question facing legislators working on changes to the state’s oyster aquaculture statutes enacted in 2017. Senate Bill 738, sponsored by Sen. Bill Cook, R-Beaufort, Sen. Harry Brown, R-Onslow and Sen. Norm Sanderson, R-Pamlico, drew strong opinions when it was discussed on May 30 at a meeting of the Agriculture, Environment and Natural Resources Committee co-chaired by Cook and Sanderson. The meeting was announced late the afternoon before and caught many by surprise because the bill is still assigned to the Rules Committee. Proposed changes include removing the residency requirement and allowing individuals or companies to own up to a total of 300 acres in water column/bottom leases. Now, individual leases can range from .5 acre to 10 acres. Oyster aquaculture consists of suspending bags or cages of oysters in the water column while they grow to an acceptable size. Traditional oyster leases involve leasing the bottom and planting oyster shells to attract spat — baby oysters. In a rare instance of unity, the Coastal Conservation Association (CCA) and commercial fishermen attended the meeting to voice objections to lifting the residency requirement and the increase in total leases from 50 to 300 acres. Sneed said that the CCA has long supported aquaculture as an alternate occupation for fishermen but doesn’t support giving control over public access waters to those from out of state for industrial aquaculture operations. CCA’s concerns are being echoed by fishermen. Glenn Skinner, North Carolina Fisheries Association (NCFA) executive director, said that the organization has not yet taken a formal position because it didn’t receive the proposed changes early enough to be able to digest them. But, said Skinner, some of the group’s membership and board members also have expressed concerns about the acreage increase and the removal of residency requirement. And there are fears that the leases will interfere with traditional fishing grounds. When the NCFA board meets later this month to discuss the issue it might be a contentious conversation. One of the board seats is occupied by a representative of Cooke Seafood, a Canadian company that does business globally and purchased Wanchese Fish Co. two years ago. It is assumed that the changes are being made for the foreign corporation, but questions to Cook’s office about who requested the changes received no response. Instead a press release hailing the virtues of oyster farming was sent. A mirror bill, House 1024, has been filed by Rep. Beverly Boswell, R-Dare, Rep. Pat McElraft, R-Carteret, Rep. Phil Shepard, R-Onslow, and Rep. Mike Speciale, R-Craven. That bill is now in the House Finance Committee. Several attendees voiced opposition to the changes, but the move also drew about five who spoke in favor of removing the residency requirement and expanding the total acreage. At least two of the supporters were employees of Cooke Seafood. A Cooke Seafood representative was asked by the committee for his thoughts and, according to several in attendance, he replied that if the state wants a cottage oyster industry that the company would see no reason to stay or invest in the state. Speaking as an individual, Steve Weeks, the NCFA’s attorney who also farms oysters and has a commercial fishing background, told the panel that removing the residency requirement conflicts with the state’s Constitution, which stipulates that all public trust resources are owned by the people of the state, and case law supports the premise that only people of the state can control them through leases. That is raising questions about the aquaculture bill that also was passed in 2017 to allow fish pens to be placed on leases in the state’s sounds. That legislation, also sponsored by Cook, was requested by the Canadian-based Cooke Seafood, which has fish farms around the world. That legislation also does not include a residency requirement. The global corporation has not been without problems. Federal charges were brought against the company in Canada after it used a banned chemical to spray for sea lice on salmon raised in pens. The violation was found after lobsters were found dead in nearby pots. That chemical is not banned in US and kills shrimp and lobsters. Recently, the State of Washington moved to cancel some Cooke leases for fish pens and phase out all others after an estimated 250,000 non-native salmon were released in the Puget Sound due to an equipment failure that allowed a huge pen to collapse. The escape occurred during the annual Chinook run and drew outrage from tribal communities and environmentalist fearing interbreeding with the native salmon or the spread of disease. The pen-raised fish are prone to disease because of the high number put into the pens. Often the fish are injected with antibiotics before placing them in the pens in an effort to thwart the problem. The original oyster legislation enacted in 2017 has already encountered hiccups that have resulted in unanswered questions, but none of those issues are addressed in the proposed legislation. Sneed referred to the problems, which have included at least two lawsuits. “The Division of Marine Fisheries needs help,” he noted. Issues of concern identified by the Division of Marine Fisheries include lease siting and conflicts with public trust uses; potential for increasing litigation expenses; navigation hazards over bottom gear/cages; experience of applicants varies; and gear cleanup and abandonment. Conflicting uses include navigation; both recreational and commercial fishing; recreation including swimming and kayaking; duck blinds; and waterfront development. DMF also has identified potential legislative actions including: restricting the siting of new shellfish leases to a designated safe distance of existing duck blinds; establish requirements to address multiple leases in a given area to minimize impacts; require a performance bond or insurance to address liability to the public and for derelict gear from and on a lease. The committee is expected to resume discussions about the bill this week. Another bill filed by Boswell, H 959, seeks to reopen the shellfish laboratory in Dare County. The $272,544 in funding for the office and related positions is being taken out of funds originally appropriated for cultch planting. The deduction is part of the reduction from $1.1 million to $402,156 which, according to the state budget, is equivalent to actual expenditures in 2017-18. WHEN will our commercial fishermen & their friends and family realize that they’ve been sold down the river? The current “leadership” in Raleigh doesn’t give a damn about the working man /commercial fisherman in the eastern part of NC. “Senator Cook and I have met with multiple stakeholders and associations, developing/crafting thoughtful legislation in order to implement a comprehensive plan to expand/increase fresh wild-caught and farm-raised oysters in Carolina.”…translation….my corporate handler have a desire to destroy all that makes coastal NC unique. Bad legislation! I think we can all agree that production is not the end goal, that we don’t want to go down the path of the green revolution when family farms gave way to consolidated factory farms owned by distant corporations. Please pay particular attention to provisions striking out a residency requirement and expanding acreage controlled by one person or corporation to 300 acres. And please do not criticize rural people for raising concerns. There are plenty of examples where profit – not community well-being – has been the priority of government and big industry working in tandem. You get—-along with coastal drilling. Very informative article – thank you, Sandy Seamans Ross. Call your elected representatives and let them hear your voices. Email them too. The removal of the residency requirement seems awfully important to me – as does the acreage issue. Looking forward to follow up articles. “A Cooke Seafood representative was asked by the committee for his thoughts and, according to several in attendance, he replied that if the state wants a cottage oyster industry that the company would see no reason to stay or invest in the state.” This speaks volumes, doesn’t it? Thank you Sandy Semans Ross for this thorough piece. I think it’s funny how commercial fisherman think they have anymore rights to fish or harvest than a corporation does! The fish don’t belong to commercial fisherman. The fish don’t belong to a recreational fisherman. They belong to citizens of the state. Stop comparing commercial fisherman to farmers. Farmers own , plant , grow , harvest and sell their products. While also paying taxes and employing people. Commercial fishing is like me walking on my neighbor’s yard and stealing an apple off a tree he planted. Commercial fisherman ruined this industry long ago. We all know it. They complain about stock limits , quotes and mandates. It’s the government that saved the industry not destroyed it. Greed is what’s behind the problem. Overcatching for profit. No one is gonna stop over catching when more money in their back pocket is motivating them. So I don’t feel sorry for them. I have two boats. I can go catch fish to feed my family without using nets. bev , cook, & jordan aren’t from the obx , district or NC. they transplanted & immediately ran for political positions as soon arrived almost like them were paid too.